he environment. I recently discovered a great online store called ReUsies. 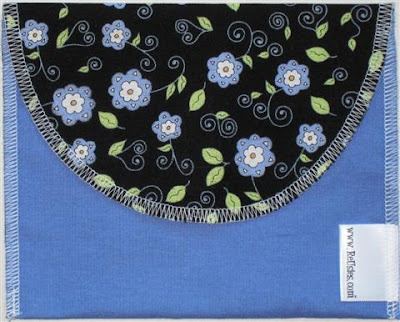 ReUsies offer an extensive design collection of reusable Sandwich and Snack pouches to replace plastic bags. ReUsies generously offered to send me both a Sandwich and Snack pouch as well as allow me to give one of each away to one of my readers! I'm unsure of the design you will receive as I didn't choose mine but, I loved what they chose for me to review! This ReUsies bag below is the design I had received. Both bags match and if I hadn't mentioned it before, I adore purple and green colors. These bags are well stitched and the materials are of good quality. There are velcro pieces on the bags to help keep your pouch securely closed when in use or during the washing period. Another great benefit of cleaning these bags, you can wash them in either the washing machine or dishwasher. ReUsies are also perfect size to slip into your purse or backpack during the day and wash easily. Now, if only ReUsies would come up with matching lunch sacks! I'd love to see that product in the ReUsies line. As mentioned in the note received with these pouches, you should pack your sandwiches and snacks the morning of use. This is due to the fact that these bags are not completely air tight. This is just one of the cons and not a huge issue if you pack your snacks/lunch the morning you will be enjoying the contents. You'll love ReUsies bags and let's not forget, each time you use one of these bags, you continue to help keep trash out of the landfill! Don't want to wait and see if you are the lucky winner? Visit ReUsies to purchase your favorite Sandwich and Snack designed bags. One of my readers will win one of each product- Sandwich and Snack bag. Take a look around ReUsies and let me know your favorite design! Disclaimer: I simply received a sandwich & snack bag from ReUsies and have posted my own, personal and unbiased opinions. I hold no responsibility between you and the company, and/or products you may purchase or receive from them. I love the brown bird sandwich size! I love the Eco Chic style. I love the Take Flight sandwich bag! The Eco Chic and the punk rock pins are my faves! I like the flower chain snackThanks for the chance. I like the Blue Burst design. "Animal Crackers" is super cute! Batter Up. I don't take a sandwich but my man does every day. That's a lot of baggies. My favorite pattern is Ocean Wave. I like the Luck of the Draw fabric. Thanks for the giveaway. I like the Eco Chic Snack. Reusies Twitter follower as jennem1. I think my favorite is the "such a square" print. I like the let's race bags..